Jerry's New Beginning A success story about lifestyle change. Radiant Health Good health follows the laws of cause and effect. 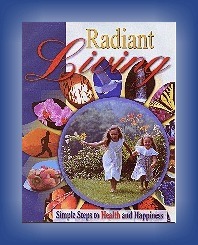 Steps to Radiant Living NEWSTART: Basic good health principles. New Start +2 Gratitude and service to others are health principles too. The Radiant Person The inseparable four dimensions of life. A Healthy Attitude The health value of a positive outlook. A Happy Family Finding love and happiness at home. Hope for the Hurting Asking the hard question, "Why is there disease?" True Healing Conditions for miracle healing. Counterfeit Healing Dangerous healing miracles that don't come from God. The Bible Says Collected Bible verses about health. Questions and Answers Bible verses sometimes misunderstood to apply to health. The Final Healing Jesus' second coming finally removes disease. If you have a United States or Canadian post office address, Project Restore will be happy to send a complimentary copy of this magazine to you (limit = one copy per person). Please use this form to make a request. If you don't have a U.S. or Canadian address, you may click on the links above to read and/or download this magazine.